We often tell clients that ‘culture eats strategy for breakfast’ (Peter Druker) to emphasise the importance of having an embedded organisational culture in the workplace. Culture and strategy are undoubtedly interlinked, as the success of one directly impacts on the success of the other. Culture brings together the implicit and explicit reward systems that define how an organization works in practice, no matter what an organizational chart, business strategy, or corporate mission statement may say. With a proven link between leadership behaviour and reward systems directly impacting on organisational performance, companies are using qualitative and behavioural information (such as the MSCEIT emotional intelligence test) to understand, develop and influence the organisational culture. This is not to dismiss the importance of developing and executing a strategy that represents the tactical, operational and strategic goals of an organisation. 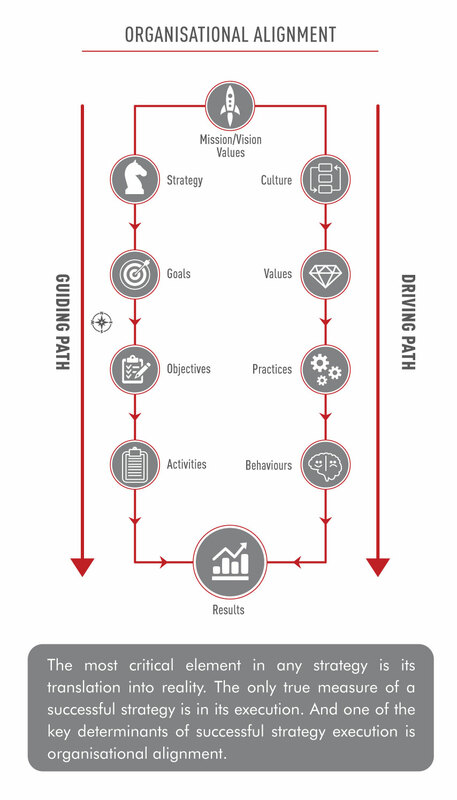 Both strategy and culture should have emphasis for organisational alignment; with the rational components (strategy, goals, objectives and activities) providing a guiding path to success, and the non-rational components (culture, values, practices and behaviours) being the driving path to achieve results. When both components are working collaboratively, with correct emphasis placed on each at the appropriate time, a company will be well placed to achieve organisational alignment. If you are looking to achieve organisational alignment in your company, contact TMS Consulting on solutions@tmsconsulting.com.au as your first step for a successful and sustainable future.